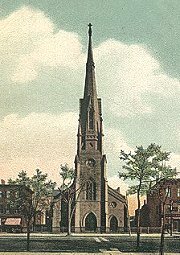 The Third Reformed Dutch Church, also known as North Reformed Church, was organized on December 16, 1856. Services were held for a time in Oration Hall. The building of the church was commissioned in 1857 and the cornerstone was laid on September 14, 1857. The stone building was erected at (115) Broad and Bridge Streets. The church, built for $32,000, became the Sunday meeting place for many of the city's elite. The church was badly damaged by fire in 1922 and 1931, but was restored to a functioning church. It is of Gothic structure with buttressed walls. A Sunday School was added in 1883.